Chicken Schnitzel is an all-time classic at home. 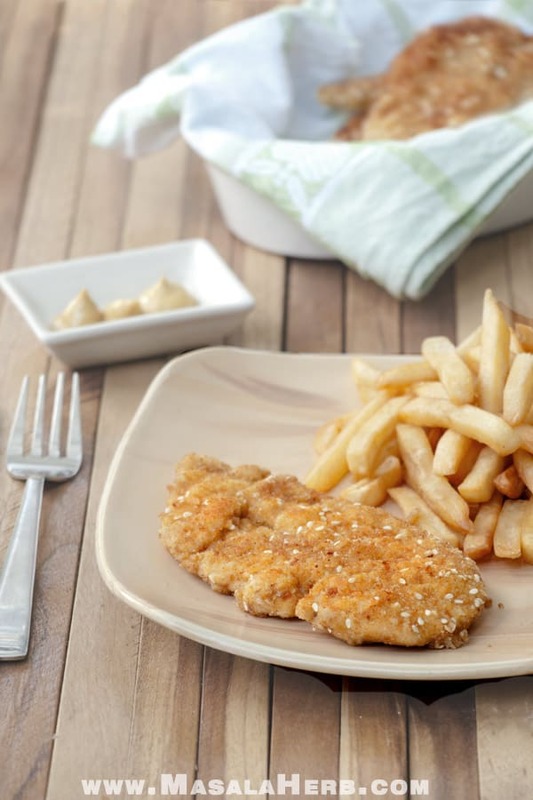 This is an Israeli Schnitzel recipe with sesame seeds. The middle eastern Schnitzel is with Chicken meat prepared and is usually served with Hummus. Schnitzel is not just simply Schnitzel! This is the food philosophy in my home country, Austria. You see, Austrians live for their dearest Schnitzel; we love it, we praise it! If the world would take away our Schnitzel, we would be doomed, or so it appears. A Schnitzel is thinly cut of meat, which can be breaded or not. The world mostly associates Schnitzel with the Wiener Schnitzel (Vienna), which by the way is always a breaded veal cutlet. The Germans mostly prepare their Schnitzel with Pork meat, however, both variations can be commonly found in the German-speaking countries. Another common “new age” Schnitzel in Europe is the turkey meat Vienna Schnitzel, which is quite popularly sold as a working-class lunch meal, between a Kaisersemmel roll, a lettuce leaf and some sauce. Chicken Schnitzel, on the other hand, can not be found in Europe, but it is the most popular Schnitzel in Israel. There are other different Schnitzel types, such as the Jägerschnitzel, and most or not breaded but prepared with a flavorful sauce. How to serve Chicken Schnitzel? I always serve my Schnitzel, as it is the custom in Austria, with lingonberry jam and some fragrant horseradish mustard from the alpine Austrian region, Tyrol. The jam is a bit sour but sweet and if homemade, you can taste a distinct deep flavor, a characteristic of this particular rare alpine berry. Horseradish mustard paste is not that sharp compared to Dijon mustard. It has more flavor dimensions and a spicy, not hot, base flavor. You may serve your Chicken Schnitzel the Israeli way, with Hummus and a little salad! You can also prepare a Chicken Schnitzel Sandwich by adding lettuce leaves and mustard to your sandwich. I like to use Rolls for this kind of sandwich. 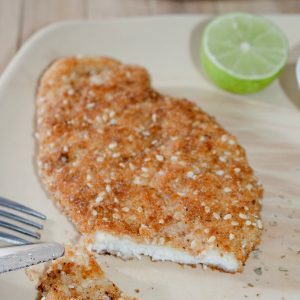 Easy homemade Chicken Schnitzel Recipe with sesame seeds. This is the Israeli Schnitzel variation. Serve it with your favorite sauce some cooked potatoes and a salad. Cut off and discard any tough boney chicken pieces from your clean chicken breast pieces. 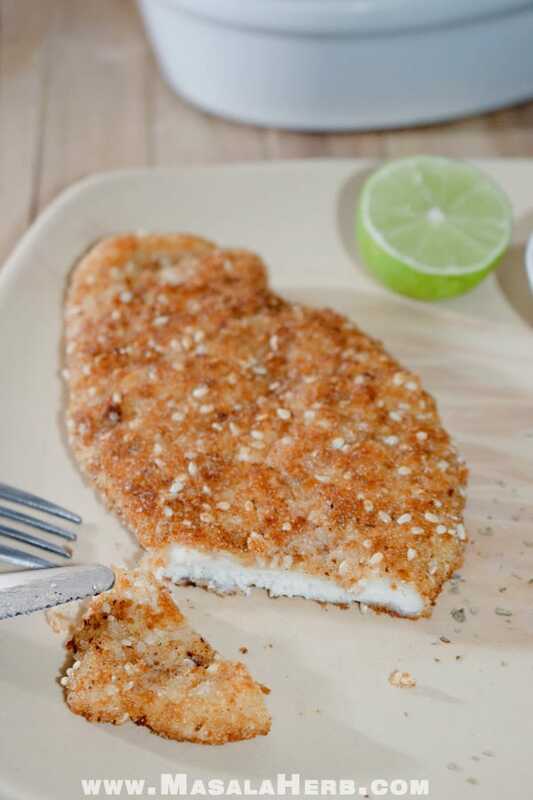 Cut lengthwise so that you have four schnitzel out of 2 chicken breasts. Large chicken breasts tend to be a bit fat so cutting them lengthwise reduces the cooking time and the schnitzel will be better cooked. Prepare 3 plates/bowls, one with the mixed flour+salt+pepper, one with the beaten egg and the last with the breadcrumbs mixed with the sesame seeds. Coat one schnitzel at a time, first with the flour, then with the egg and at last with the breadcrumbs mixture. The schnitzel should be covered each time well with the flour first, then the egg and at last the breadcrumbs. Add the oil to a frying pan and heat up. Once the oil is hot (but not too hot and smoking!) place 1-2 schnitzel at a time. Fry each schnitzel side for a few minutes on medium heat, or until golden brown. Serve hot with french fries or butter parsley potatoes and a dipping sauce of your choice. We usually serve Schnitzel in Austria with lingonberry jam and fragrant horseradish mustard paste. The Israeli version is served with Hummus, french fries and a small salad. Dear reader, how are you planning to serve the Chicken Schnitzel? I actually prefer chicken over veal. Your schnitzel looks perfect. I saw schnitzel once in a food program but never thought it would be so easy to make it. It sounds so delicious and the texture sounds wonderful. I had no idea there was unbreaded schnitzel! I always thought schnitzel was just simply Schnitzel! Love all your information with this recipe – your schnitzel looks mouthwatering – love the recommendation to eat it with ligonberry jam! I usually pound my chicken when I make schnitzel with it. Veal is wonderfully tender, but chicken has more flavor, IMO. And pork even more so. Great schnitzel lesson! Love the idea of adding sesame seeds — I’m so going to try that! Those look so delicious!! We call them ‘chicken cutlets’ in Kolkata, and are they are one of the most favorite of Bengal fast foods. I never knew these were as famous in Austria as well! Is it possible that it somehow came from Austria and the Bengalis couldn’t pronounce ‘schnitzel’ and called them cutlets instead? Something to pinder over surely. Learn something new everyday. Your post made me so nostalgic!! My mother use to make this with chicken all of the time. It’s fast, easy, and delicious! Yours look quite perfect! Schnitzel is one of those comfort foods that are fried and that surprisingly, I adore! Mom used to make it with veal (pork for me, as I didn’t eat veal in those days) and she would soak the veal in milk overnight. In Hungary, we just give a good squeeze of lemon on top. My mouth is watering as I comment. Rizzy bizzy (white rice with green peas) was a common side with of course, vinegar cucumbers. Surely gonna try this one. nice recipe.looks yummy and nice representation. Love this education about schnitzel, and love the recipe, too! Thank you for sharing. Mmm I’m loving the look of this! I’ll have to make this recipe when I get home – I think my family will love it! Oh yes, I love schnitzel too! Deeeeelish! I love the sound of serving with lingonberry jam. Thanks for the recipe! I LOVE Israeli, well, anything, but in this case shnitzel! I love sesame seeds on everything. 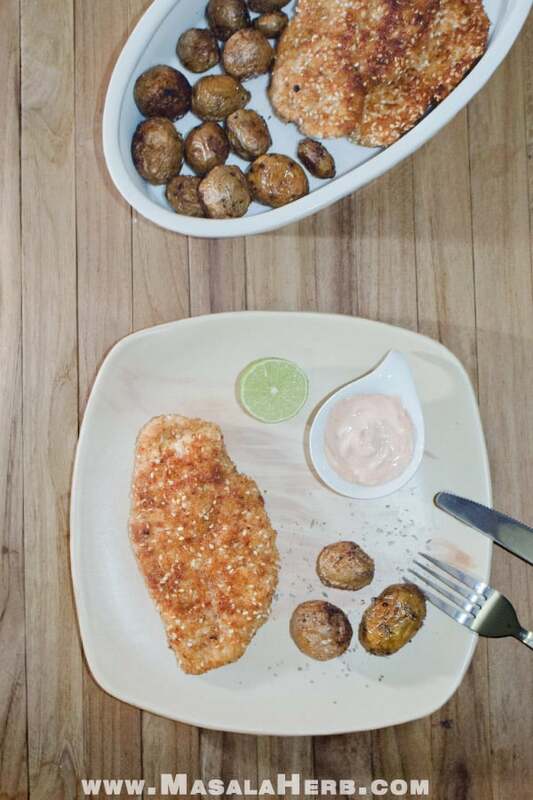 Hi, this may be interesting you: Easy Chicken Schnitzel Recipe!